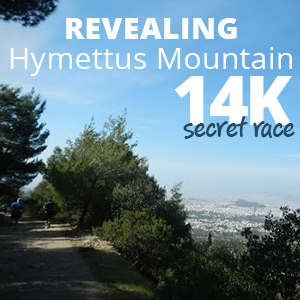 The Olympus Marathon, the international mountain running event in Greece, is offering a unique opportunity to experience the beauty, history, and the unique energy of the world famous, Greek mythical mountain. Runners will have the chance to follow the traces of history in the legendary "mountain of the Gods" and pass through unique scenery that offers tremendous view, taking part in one of the main races of its kind throughout the world. 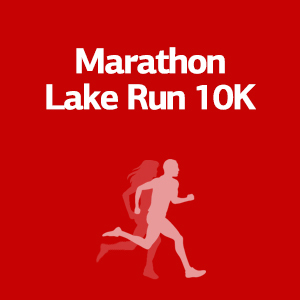 Please note that there are specific qualifications criteria to participate in the race. Please read carefully the race rules and regulations. 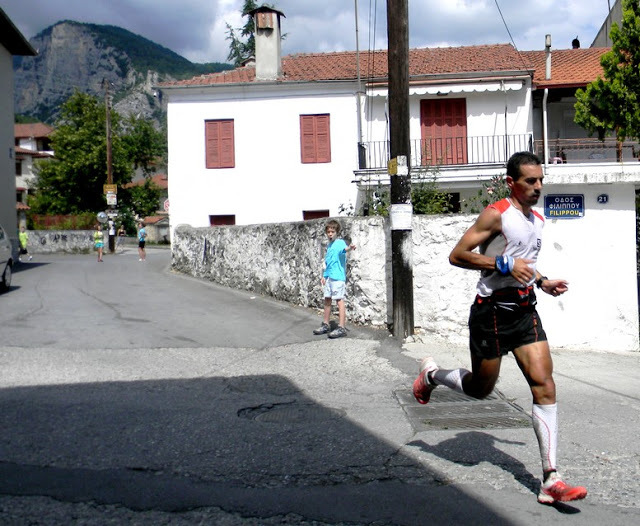 The essential condition for participating in the Olympus Marathon is a previous experience in similar races (mountain, trail, fell). Non-Greek residents must have completed at least one mountain/trail event of more than 30K in the last two years, in a country other than Greece. Welcome to the Olympus Marathon which offers the opportunity to enjoy a route that revives the sacred trail ancient Greeks followed to Olympus, where they ascended every year in order to honor and sacrifice to Zeus. 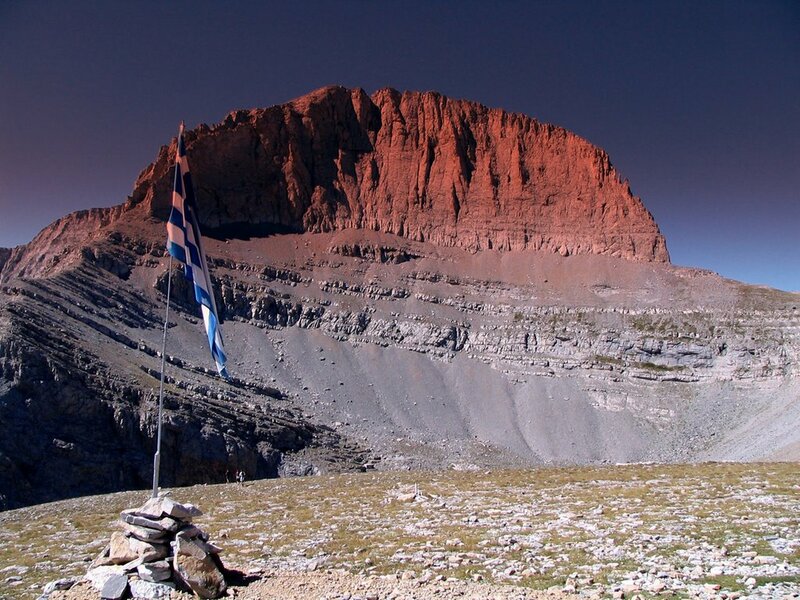 Olympus, Greece’s highest mountain is the main attraction in a national park rich in history, culture, and ecological diversity. Because runners can experience an exciting athletic experience that forwards physical activity, in touch with the breathtaking landscape of the "mountain of the Gods”. The race is taking place at a remarkable location, which is a National Park and also listed as a “World Natural Heritage Monument” by UNESCO. We offer several options varying from short weekend breaks in Litochoro including your entry to the race, to a full vacation plan in Litochoro and the surrounding area! Moreover, we can offer you training plans, actual training in the streets and routes of Litochoro and of course we will run with you! 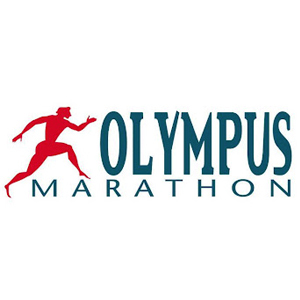 Please note that The essential condition for participating in the Olympus Marathon is a previous experience in similar races (mountain, trail, fell). Non-Greek residents must have completed at least one mountain/trail event of more than 30K in the last two years, in a country other than Greece. Registration is open until Thursday, 1st of June 2015. Participation can be obtained via online registration. 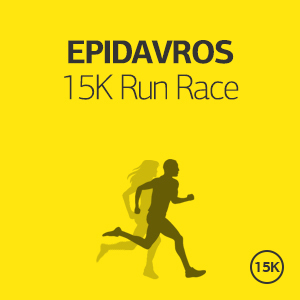 The race starts at the archaeological site of Dion, 3 m. above sea level. At first, the athletes run on asphalt road crossing the settlement of Dion village. Right after the village, the route moves on a asphalt country-road towards the mountain in a slight ascending incline. 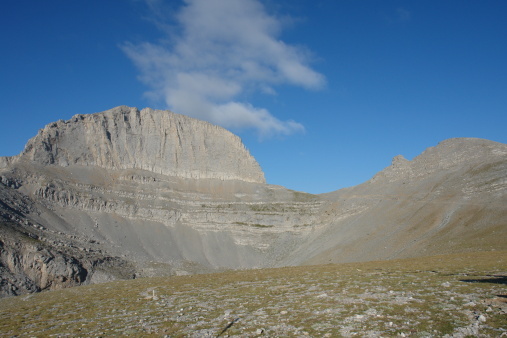 At Km-5, the track reaches Olympus foothills, (alt.150m). After some road twists, the athletes leave the road at Km-6 to enter the trail that will be followed for the next 36 km. At the beginning, the trail moves in the ravine of ‘Orlias’ with dense bush vegetation, which soon becomes a forest with broad-leafed trees. The athletes run on a moderate trail with many twists but the field is clear without many rocks. For quite some time, the runners can hear the sound of the stream running in the ravine below forming several distinctive falls. Later, the trail moves away from the ravine and the athletes dive into a wonderful pine tree forest! After Km-9, the route crosses a dirt track twice, then once more and follows it for about 500m. to reach Station-3 (Koromilia). Further on, it enters the pine forest again and climbs up. At this point, the trail is wide and clear and after gaining some altitude, it reaches a forested slope at Km-13 at Station-4 (Bara). Then the trail emerges to a ridge and the view is wide open and one can distinguish the peaks of the southern part of the mountain. The trail here is not clearly defined but the marking is frequent so that there are no doubts about the right direction. At Km-15, the athletes reach the Station-5 (Petrostrouga) alt.1940m, where the first 3:45 hours cut-off point is also located. The vegetation at this point includes exclusively the ‘robolo’, a kind of high altitude pine tree. 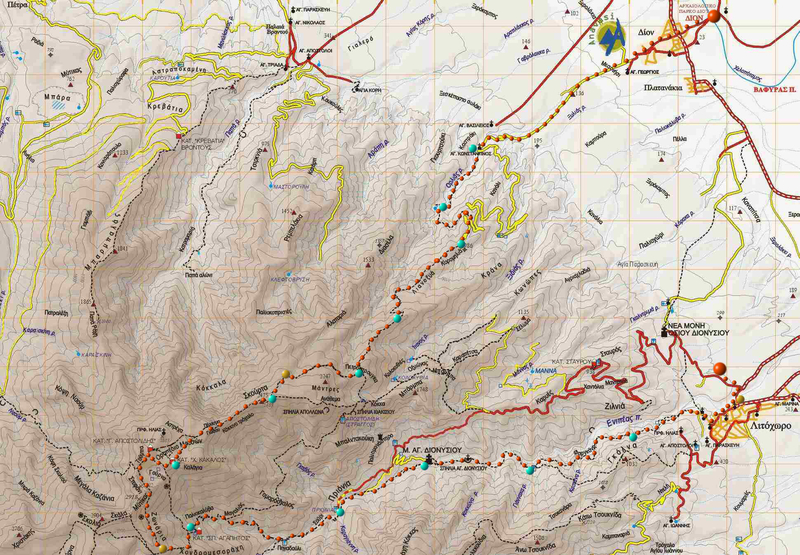 The runners now follow the main trail to the higher part of the mountain, which they have crossed earlier at Station-5. The field is fine without any loose rocks. At Km-17, the vegetation becomes bushier and then it is gradually eliminated near the alpine zone as the athletes climb above the tree level at 2200m. At Km-18, past Station-6 (Skourta), the runners view the main complex of the mountain higher peaks for the first time. ‘Zeus Throne’ is there with its prominent shape dominating beyond the ‘Mousses Plateau’. To reach that point, athletes follow the ridge that leads to the ‘Mousses Plateau’-a spot with a fascinating view at any direction. After an arduous short climbing on rough field full of sharp loose rocks, the trail finally leads to the ‘Mousses Plateau’. This is a high altitude meadow (alt.2500+), which lays at the highest part of the mountain with ‘Zeus Throne’ peak above it at its western end. Runners now head towards this direction with a stunning view to the towers of ‘Zeus Throne’ at 2911m. Soon, they reach Station-7 "Oropedio Mouson" (Muses Plataeu) next to ‘Apostolodis’ refuge (alt.2690m). Here is the second cut-off point at 5:30 hours. 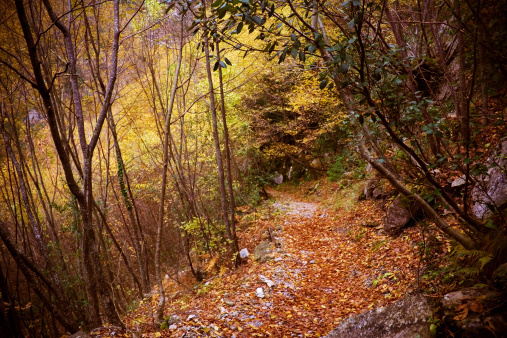 From here, the athletes enter the last part of the race, following the main trail, which goes along the Valley of Enipeas River. This river has its sources at Prionia. 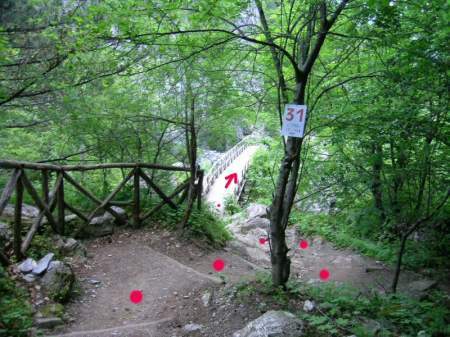 The trail now is well marked and very safe although there are some technical parts that require one’s attention. The vegetation here is dense and refreshing. 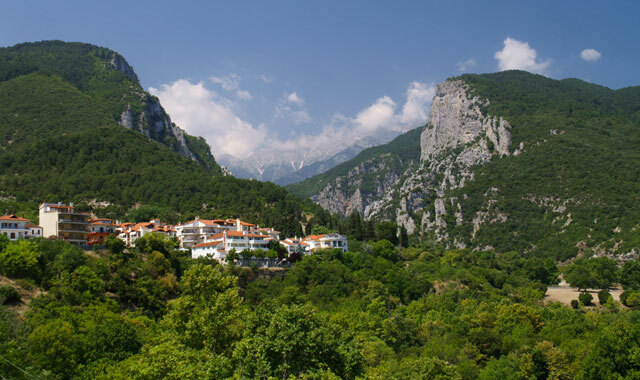 At Km-34, the trail passes past the old Monastery of Aghios Dhionisiow as well as past Station-10 (Monastery). Then it crosses the river several times over small wooden bridges that lead across from one bank to the other. At Km-36, the trail keeps on the south side of the valley, which gradually becomes steeper, forming a wide gorge with numerous ups and downs but always on fine terrain. An extended ascent at Km-39 takes the runners to 200m higher altitude where the (last) Station-12 (Portes) of the race lies. At this point, the athletes will enjoy a view of Litochoro Town for the first time. 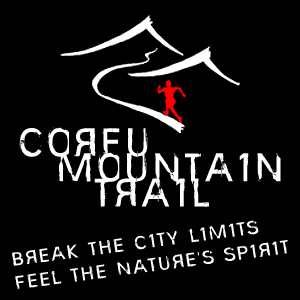 A steep downhill track with loose, sharp rocks will bring runners lower and at Km-42 they reach the outskirts of the town. This is the end of the trail. The two last kilometers are on asphalt road. The finish line is at Litochoro Park that lies at the center of the town. The table below presents the nutrition and quantities offered to OM participants. Each participant can, of course, carry by himself, all the type of food he wants. No plastic cups are offered by the race (apart from the first check point). Each athlete is responsible to carry his own cup, in which the shown quantities of water and electrolytes will be given. Only one gel in the mentioned check points is offered in every athlete, which must be consumed on the spot. The electrolytes also contain carbohydrates. A commemorative medal and participation diploma will be given to all participants who finish the race. An Award Medal will be awarded to each of the first three winners of the general classification for Men and Women Categories as well as to the first three winners of age groups M18, M40, M50, M60 & W18, W40, W50, W60. A precondition for the top athletes of the age-groups of both sexes so to be awarded is the presence of at least 6 of them at the finishing point. Otherwise only the first category winner will be given an award medal. The essential condition for participating in the Olympus Marathon is a previous experience in similar races (mountain, trail, fell). Non-Greek residents must have completed at least one mountain/trail event of more than 30K in the last two years, in a country other than Greece. However, if you book through this service you still need to register for the event selecting our Simple Running Offer option or another service. Of course, you can still use our Stay! service even if you do not participate in an event or register through another service. The Simple offer is addressed to those who wish to come and stay in Litochoro on their own. It includes all the logistics of the race entry, transportation to and from the starting line, tips and advice for the specific race, training schedule depending on your personal targets and safe keeping of your belonging during the race. If you really want to feel like a champion, we are here to support you! This offer is ideal for those who want to experience Greece the “running way”, and get the most out of their visit in Litochoro. We have selected the ideal locations for you, and we will suggest you the ideal vacation plan. 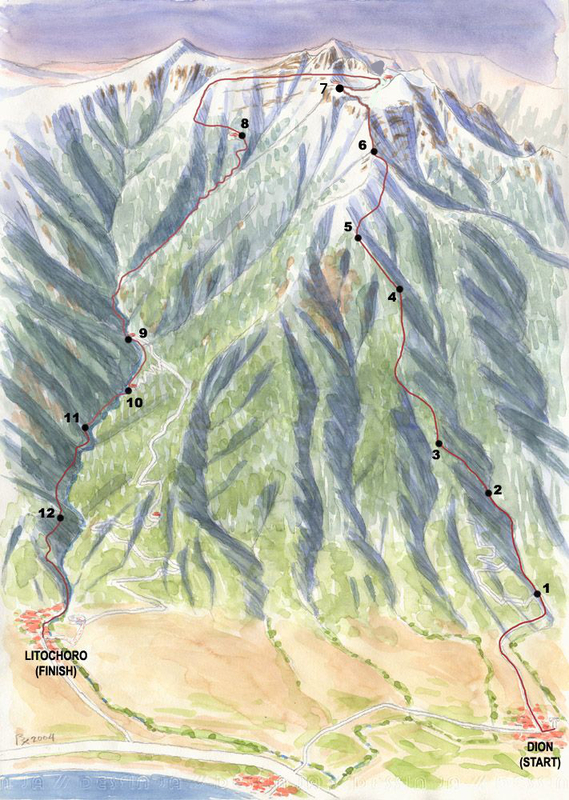 It includes the round trip from Litochoro to starting line and the hotel arrangements in Litochoro. It also includes your registration to the race and all the logistics of the race entry, transportation to and from the starting line, tips and advice for the specific race, training schedule depending on your personal targets, safe keeping of your belonging during the race, suggested vacation plan for all the days that you will be in Litochoro, and many more! It starts from €200 per person (runner or not) for a three days/two-nights accommodation in a 4star hotel. If you wish to stay longer, you may add as many nights as you want for an additional €50 per night per person. Please tell us all your requirements and preferences, how many days you want to spend in Litochoro, what other places you wish to visit and we will come back with a tailor-made offer specific for you! We can add trainings, running tours, car/bike rental, excursions, family activities and many more. In any case our offer will include the hotel arrangements, transportation to and from your hotel, participation to the race and all the logistics of the race entry, transportation to and from the starting line, tips and advice for the specific race, training schedule depending on your personal targets, safe keeping of your belonging during the race and suggested vacation plan for all the days that you will be in Litochoro. If you are a group of people, please tell us all your requirements, how many of you are running, what you like and what you do not like and we will come back with a tailor-made offer specific for you and your company! We can add trainings, running tours, car/bike rental, excursions, family activities and many more. In any case our offer will include the hotel arrangements, transportation to and from your hotel, participation to the race and all the logistics of the race entry, pasta party, transportation to and from the starting line, tips and advice for the specific race, training schedule depending on your personal targets, safe keeping of your belonging during the race and suggested vacation plan for all the days that you will be in Litochoro. 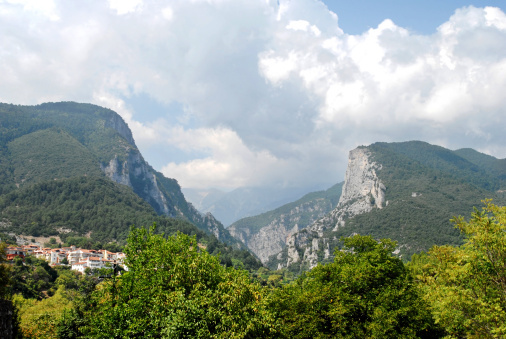 Litochoro is a small modern town located at the foothills of Mountain Olympus just five km from the sea. 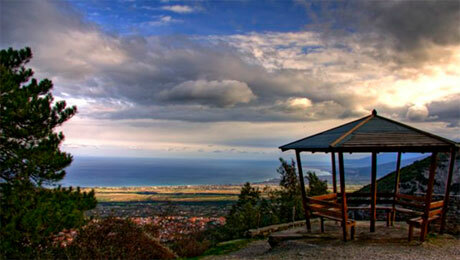 It is located on the south side of Pieria, 90 km from the Thessaloniki and 22 kilometers from Katerini. It combines the cool of the mountain air with the sea breeze and visitors can walk around the lanes between the traditional houses with the Macedonian architecture, the old wooden courtyard doors and the gabled roofs, work of Litochoro wood turners and stonemasons. The local folk traditions are kept alive through customs that are continued to the present day. Litochoro is an ideal base for investigating the wider area due to its easy access and excellent tourist infrastructure. 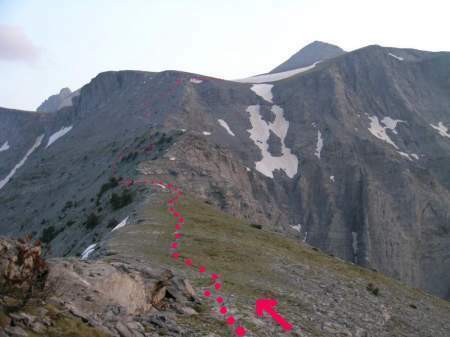 And at the same time is the destination for those wishing to start climbing Mountain Olympus as from here starts all attempts to conquer the peak of the legendary mountain. Litochoro welcomes the visitors, combining the vitality of today with the serenity of yesterday, contemporary services with vintage character. From the entrance to town, its houses with their red tiled roofs and litter-free streets give the impression of culture and civilization. Its medieval configuration with its intensely traditional atmosphere takes the visitors many years back into the past as they wander in and out of its narrow, meandering alley. But what conveys the mood of the old days more than anything else are the houses. Litochoro's traditional houses have all the features of the celebrated Macedonian architecture. Furthermore, the local builders, stone masons and carpenters were always famous for their craftsmanship. In Litohoro, keeping up with tradition is a way of life, bound up with eloquent spontaneity and true folk spirit. Customs and religious ceremonies have their source in antiquity as well as in the Byzantine era. Beauty greets the visitors in every corner of Litochoro. Traditional beauty in town, natural beauty outside it and the perfection of nature that surrounds Litochoro, makes it an ideal place for holidays in all seasons. Magnificent, imposing, observing for millennia the life down in the valleys and shores below, Olympus Mountain looms above Litochoro, joining its peaks with the heavens and leaving the myths to roll down its slopes, wander its woods and ravines, encountering history and spectacular natural beauty. 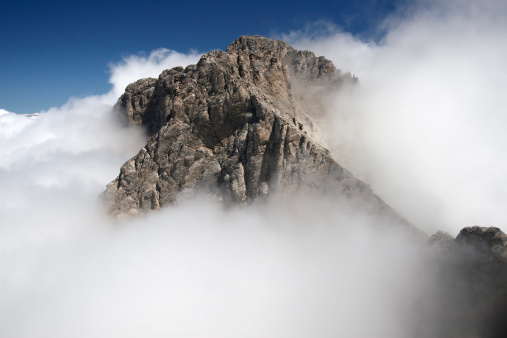 In 1938, Olympus, the highest Greek mountain, the residence of the twelve ancient gods, was the first area which was declared as a National Park. About 50 years ago a special regime was enforced to protect this unique part of Greece. Olympus is internationally known as for its important ecological characteristics and incomparable natural beauty as well as for its strong relationship with ancient Greek mythology. The importance of the National Park has been recognized not only in Greece and Europe but all over the world. In 1981 UNESCO declared “Olympus a Biosphere Reserve”. The European Community has included Olympus in the list of “The Most Important Bird areas of the European Community”. The awe-inspiring ridges of the highest mountain in Greece, the verdant Enipea Canyon and the view of the Thermaikos Gulf create a landscape of unique beauty. 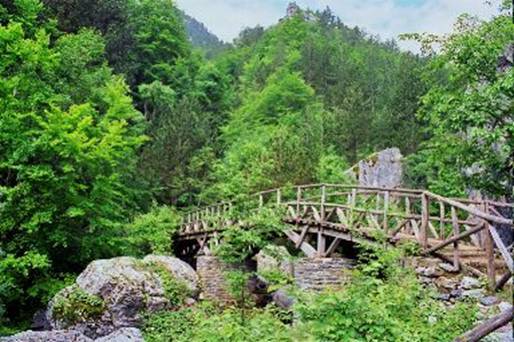 Approximately 1700 different types of plant are to be found in Olympus National Park along with rare types of bird, numerous waterfalls which contribute to the stunning landscape. The Thermaic Gulf offers its delights on shores that stretch for thirty kilometers with sandy beaches and the bluest of waters. Facilities for tourists provide a full range of accommodation and entertainment. The organized beaches have all the possibilities for water sports, while anglers have only to wade a bit into the open sea. At the picturesque taverns the fish is fresh caught and washed down by retsina from Olympus prepared as only the Litohorians know how from the nectar of the gods. The local cuisine offers a wide variety of traditional foods, sweets and drinks customarily made with genuine local ingredients which ensure healthy nutritious and delicious dining. The visitor can expect plentiful traditional Greek dishes with the scent of oregano, parsley, basil, mint, nutmeg, cinnamon and cloves. There is a wide variety of local liqueurs made with traditional methods with fruits such as cranberries, blackberries, mandarins and bitter almonds, which can be found in abundance in the whole region. Traditional sweet fruit syrups, jams, compotes, honey and apicultural products bring images, tastes and smells of times past.